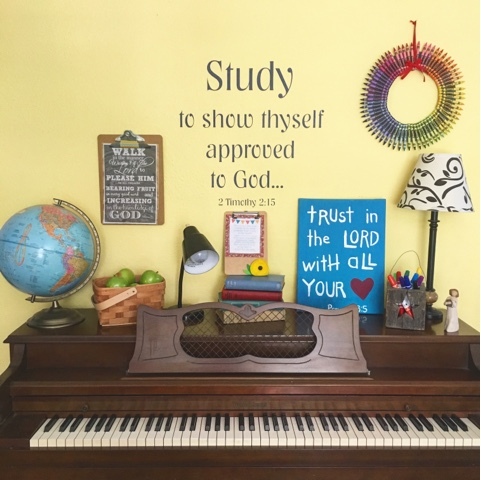 As I begin looking toward a new year in homeschooling, I always begin the same. A thorough house cleaning. I need things fresh and new feeling to encourage my thoughts. 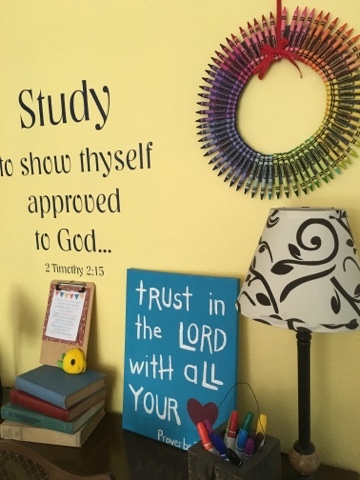 I already shared with you how I found this little globe lamp at our local homeschool fair. 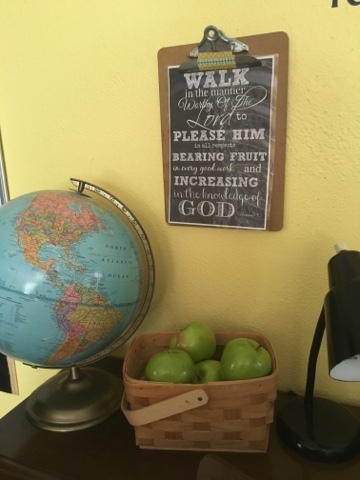 Another fun aspect to our homeschooling room. 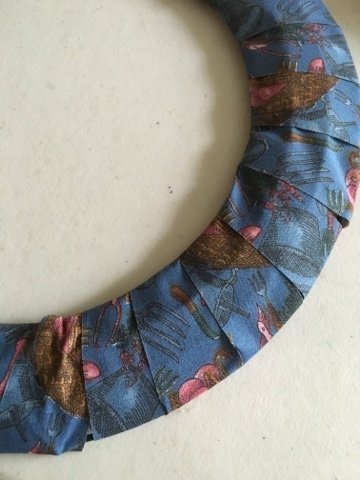 I've seen these sweet little crayon wreaths floating around and decided to make one myself. A word of direction should you try to make one yourself. If you use the 12" wire frame, turn it over. Yes, use the frame front side down. Also, I found that it helped to secure the crayons if I wrapped the frame with ribbon. THEN hot glue your crayons to the frame. 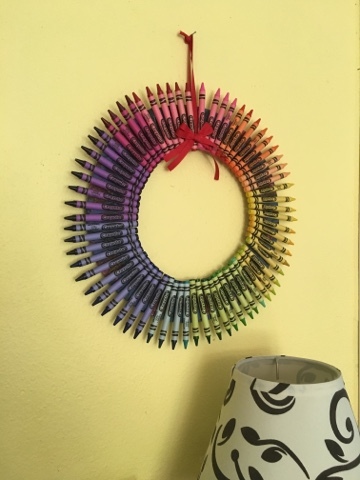 I used 4 boxes of .25 crayola crayons (since they are still on sale) So I was able to make a sweet little colorful back-to-school wreath for very little out of pocket money. Here's a pic to show what I mean by wrapping the frame with ribbon. I had some old tough ribbon that I haven't used in YEARS, so I used it to give me a sturdy base for the crayons. Everything else was just moving from one part of the house to the other. 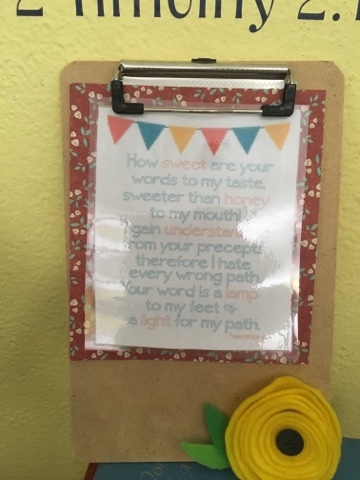 I printed the chalkboard verse from here and laminated it for the wall. 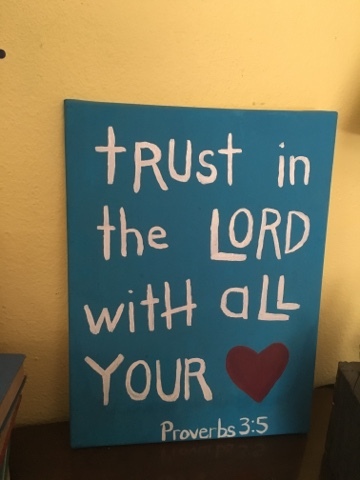 And I printed this Psalm 119 verse from here in a smaller size. This canvas that I painted over 3 years ago! What?!?! 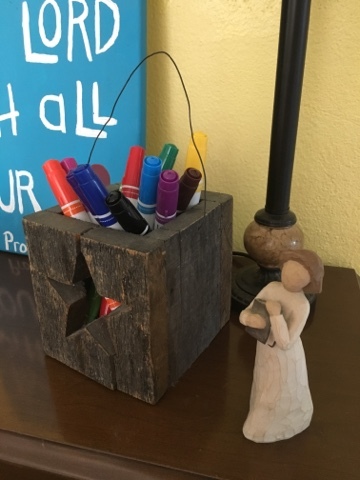 A candle holder from even longer ago with colorful markers for our organization station. that we moved into the lessons area last year. Colorful books from our library and we are set. With words of encouragement and inspiration and a mind ready for action. Now to get lessons planned out and we will be ready for our new year of learning.